THOUGH the Geraldines were strong in their day among the mountains of Kerry, they did not attempt to control the neighbouring islands; neither did any other Normans extend their dominions beyond the brink of the sea. For this reason the many islands within sight of the cliffs of the North and the West remained peculiarly Irish. There was one exception, Rathlin above Antrim; but this was always a debatable land. Even in 1612 Scotland still claimed it. There the Bissetts took up their abode; but by passing from them to the MacDonnells it again became Celtic, and it suffered accordingly, for it beheld many such scenes as that massacre when old Sorley Boy wept aloud and raved like a madman on the neighbouring cliffs, while across the narrow water his wife and his children were put to the sword. Clare Island and Achill knew fire and sword also; but that was because they were Irish. In them, as in the Islands of Aran and in those beside Kerry, the Celts remained lords. This was no doubt due in part to the fact that nobody else wanted them. Even Cromwell, though he decreed that all the islands should be cleared of the Irish, did not try to give them away. And now, though in later times there was a futile attempt to colonise Achill, they are all left in the hands of the one race eccentric enough to find pleasure in them. THIS is one of the best known hills in Killarney, and though not very high, its proximity to "The Long Range" or river from which it rises perpendicularly, makes it a striking object. Its top is bare, and on the inaccessible side grey eagles still have their eyries. This side also throws back a remarkable echo; it is repeated on Torc Mountain opposite, and in calm weather re-echoed again and again at an apparently great distance. 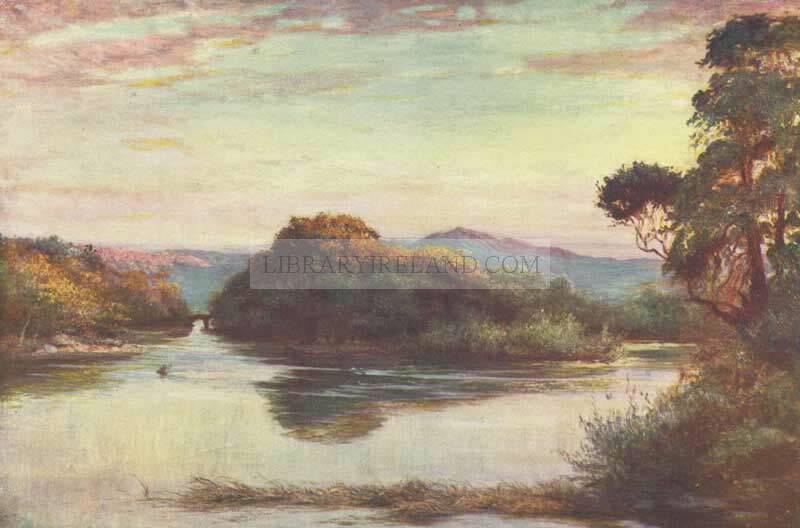 This suited all; for the Irish Celt was by nature a lover of islands. Most people would think that Ireland itself was solitary and secluded enough; but that view was not held by the Irish, for there are innumerable remnants of castles and churches and abbeys to be found in the lakes. Of course, some of these were built there because the water provided a natural moat. 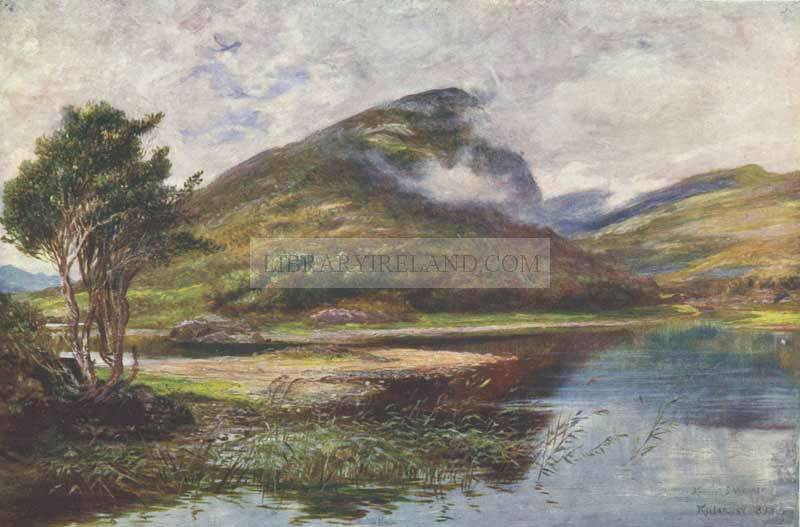 Such a one, for instance, was Ross Castle, the O'Donoghues' hold in Lough Leane at Killarney. This fortress relied so much on the water around it that there was an old prophecy that it would never be taken till ships of war were afloat on Lough Leane. That encouraging prediction was justified by the castle's immunity during many campaigns, and by its final disaster when the Puritans under Ludlow and Broghill besieged it, for they were compelled to bring boats over the mountains from Bantry. Thus the prophecy proved fatal at last, for the garrison, believing in it, recognised that the hour of doom had struck after all, and surrendered at once. Another such hold was Ballinahinch, the Castle of the Island, now only a ruin in the midst of Lough Corrib, but for many a year the proud home of the ferocious O'Flaherties. It was natural that men should enjoy the protection of water in times when every chief was accustomed to find pastime in midnight raids, or when the English were pursuing the sport of hunting the Irish Wolves; and even the monks could not overlook that advantage, since few of their neighbours would have been slow to burn a church or an abbey if it had happened to be under the patronage of one they disliked; but apart from this, the Celts loved the visible separation of islands. A little island of trees in the heart of a quiet lake hidden by mountains—such was the home they desired. There they could live secluded in the core of seclusion, and isolated from all the isolation of Ireland. Those who dwelt on the islands of the savage Atlantic enjoyed in addition to a greater security the delight of the contrast afforded by the vain and morose toil of the breakers. When Columbkille made rocky Iona "a nest of singing-birds," it was his joy to think that the music of their worship would rise over the tumult of the wind and the surf, and to imagine that sailors, hearing that melody of peace while they struggled in the grip of a storm, would dream that they listened to the voices of angels. In the same spirit, the primitive monks who were voluntary captives on Aran or Skellig-Michael or smaller rocks, found that the outer rage uplifted their silent and penitential joy. They dedicated the Great Skellig Island to St Michael because they believed that it was his task to restrain the Powers of Darkness; and they loved it the more because its barbarous rim protected a deep hollow of turf. Down in that green cup they formed a Way of the Cross; and if you visit their refuge now, you will see the Stone of Pain and the Rock of the Woman's Wail and the rest where they knelt, when in imagination they followed the path leading to Calvary; and aloft in the wind-beaten cliffs, between the turf and the surf, you will find their separated cells. Some of these islands had military hours. On Tory Island (so it is said) the Nemedians and the Fomorians from Africa fought, in prehistorical times, a murderous battle beside the Tower of Conning. From Clare Island by Mayo, Grace O'Malley, the Sea-Queen, who, sailing to England, greeted Elizabeth on equal terms, dominated all Connemara. Skellig-Michael was known to the Danes, and Valencia, the parish nearest to America, was frequented and re-christened by Spaniards. In later times some of them were linked with the names of Paul Jones and Fineen O'Driscoll the Rover. They were for a long time the nests of pirates and wreckers, places of ill-omen to ships; but now they are all peaceful again. The islands are a country apart. If you go to the Aran Islands, you will discover that the people of Arranmore, Inishmaan, and Inishere are aloof. Theirs is a primitive Christianity, little concerned with later dogmas or pomp; they have laws of their own, and those who infringe them are banished to Ireland; they are mournful and taciturn, and full of beliefs older than Dun Aengus, the vast primeval fortification on Arranmore. The people of the Island of Towers, Tory Island, were, till quite recent days, accustomed to choose a king of their own to whom they all rendered an implicit obedience. Even now most of the islanders go fishing in coracles, long narrow punts, framed of wicker and covered with tarpaulin or skins. It is probable that in such vessels as these the primitive Celts defied the storms. The many islands in the lakes had, of course, no such separate population. The chiefs who held castles on them enjoyed the seclusion the more because it only endured as long as they liked; they could be hospitable there, or participate in the battles and the feasts of their neighbours. The monks, who built churches on them and little round beehive cells in which they tasted the pleasure of solitude while retaining the other delight of sympathetic companionship, were but agreeably sundered from the life on the shores. They went there to find peace and security in a world of alarms. And now that the castles are all in ruins, the green spots they once overshadowed are as calm as the others that hold empty cells and wrecked churches that are left to the dead. Even to-day some of these islands are places of burial. Such a one is Devenish in Lough Erne, and a nook on the bank of the lake is still called the Port of Lamentation, in memory of the funerals that left it, accompanied by the wild keening of women, when the dead were borne over the water to that island of rest. You will have observed that this country is an island of islands. Just as in early days it was held by many small nations mutually hostile, so now, after all the violent interventions and the compulsory removals, each county has a separate life. In each of them there are to be seen distinctions of character; but none the less all are Irish. A man whose fathers have lived from time immemorial among reverberating cliffs and condemned to dare the rough Atlantic in coracles, cannot altogether resemble one derived from a family that has been set in a hushed wilderness of bogs. The chances of fortune should be also remembered: the subjected and colonised English Pale was compelled to differ from intact Donegal. Yet though they were apart, so was their country. The men of the bogs and the mountains and of the Pale and Tir-Connell have all been subjected by the witchcraft of Ireland.